Farming by Satellite is an EU initiative by the European GNSS Agency in cooperation with the European Environment Agency. 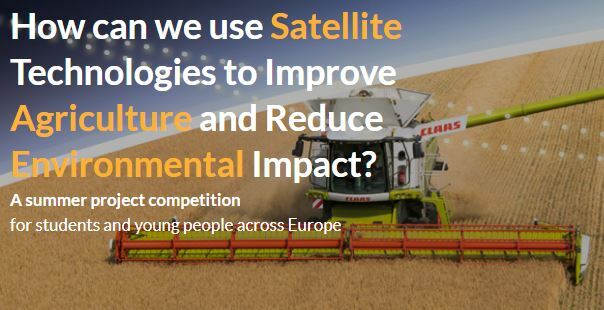 The Farming by Satellite Project has a top prize of €5,000 for the best ideas, innovations or success stories focused on how satellite technologies can support farming. The competition is open to all students and young people below the age of 32 years at the time of registration. Up to ten teams of finalists will be invited to present their ideas to judges and enjoy some time, all expenses paid, in a European city. All these finalists generate valuable prestige and publicity for their educational institute of business/employer. The competition challenge is to propose how to use satellite technologies in agriculture to improve production, efficiency and profit and reduce environmental impact. Many different types of entry are invited, including new proposals for equipment, new ideas for applications, success stories showing satellite applications for new farm or crop types, ideas for low cost mobile apps and more. The deadline for registration is 30th June 2018 and the deadline for submissions is 7th September 2018. Go to www.farmingbysatellite.eu for more details. National Fodder CrisisT5 Tractors – Testing ?